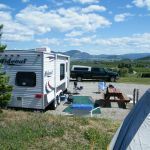 Ask fellow campers about "Apple Valley Orchard RV Park" and nearby attractions. This park was one of a few, and the most expensive, of small parks located on farms in the Kelowna area. It was essentially a $30.00 a night park located in an inflated market. There was a two night charge cancellation policy, again reflective of a heated market. On arrival, there was a sign listing names and assigned sites, but nobody in the office. The first row of sites were dusty, narrow and short. Our site was up a small hill, paved and more spacious. Landscaping was basic and you were essentially parked at the edge of open fields. It was not an attractive area. However, despite being paved, our assigned site was so far off level (both back to front and side to side) that even with all our blocks our motor home could not be leveled on the stabilizers with the rear wheels sufficiently grounded (ie. unsafe). I was able to contact the owners on their cell and they did not have another site to offer me. We left and will never return. This place may be OK for some rigs, but do not expect it. If you do stay here, insist on a level site. Rigs that can be lowered in front may be OK in the site we had, but bring lots of blocks for the back - and wheel chocks. We camped at Apple Valley Orchard RV Park in a Motorhome. There were 4 showers for the campground, of which 2 of them also has bathroom facilities. As such there was almost always a line up in the morning. The office was actually close to the exit of the park, which was a bit confusing when first arriving. (I don't recall if there were signs). The host couple was very friendly. No circuit breakers on the electrical box. Grey water connection only at our site. We camped at Apple Valley Orchard RV Park in a Travel Trailer. There was a sign on Sexsmith Rd close to Hwy 97, warning about low clearance across the railway. It might be concerning to some trailers. Small, clean RV resort, grass for each camping spot, sites in the upper are are more spacious. The location is on edge of Kelowna with a 5 min drive to the city centre and very close for amenities. The fenced in playground area was excellent for kids. The owners where very friendly and helpful. Overall a nice place to stay. We camped at Apple Valley Orchard RV Park in a Travel Trailer. We stayed here for three nights in late September. Upon arrival, we found a sign which had designated sites for those who had reserved. Ours was site 15, with all hookups, a privacy fence from the adjacent site, and a great view of the valley to the east. There are a number of fruit trees in the park, albeit a bit smaller than are shown on their web site. But no matter. There were quite a few permanent campers but that didn't detract from being a transient. The office is open during select hours which was not a problem, particularly if you have a reservation, as all you need to do is to check the board upon arriving. While there were only two restroom/showers, that wasn't a problem. They were spacious and clean. The sites have a variety of hookups, from dry camping on up. Suggest that you state what hookups you need when reserving. The location is about 3 miles from downtown Kelowna which is a great community. Lots of options for walking, hiking, cycling. A good place to start is the park along the lake, just north of the cross lake bridge. Elsewhere there are a number of wineries to sample, and downtown has some very nice restaurants. We camped at Apple Valley Orchard RV Park in a Travel Trailer. Go to the visitors centre on highway 97 where you will find helpful staff who will help you to find areas of interest. We did a self guided wine tour over a couple of days. We also found some excellent restaurants. We stayed in this park 5 years ago and it looks like little has changed since then. There are some pull-through and some back-in spots. The main things this park has going for it are the views from the camp sites and it's proximity to Kelowna. Even with that, I'd say it's a bit over priced. We camped at Apple Valley Orchard RV Park in a Fifth Wheel. Convenient spot to stay at while our daughter was in a softball tournament. Kind of pricey when one considers that there is no cable hookup, and Internet was spotty but mostly non existent. The A-E sites at the north end of the campground have great views of the valley. Host was pleasant and accommodating. For laundry, bring loonies; that is the only coin that will work the washing machine. We found this campground to be very quiet. We camped at Apple Valley Orchard RV Park in a Travel Trailer. Go to the visitors centre on highway 97 where you will find helpful staff who will help you to find areas of interest. We did a self guided wine tour over a couple of days. We also found some excellent restaurants. Are you affiliated with Apple Valley Orchard RV Park ?